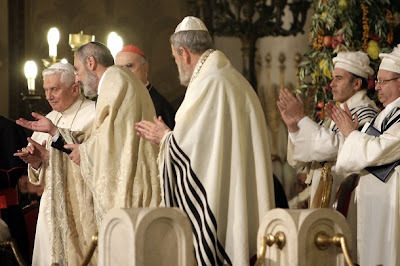 Contrary to what the pope and the rabbis suggest, the blessings of Psalms 126 and 133 (Psalm 126 evidently chosen to make modern Zionism seem providential) do not apply to peddlers of Talmudism, Zionism, Holocaustolatry and the phony "Noahide Laws." Beware the leaven of the Pharisees rising in Rome. Nicely written and argued. This pope too is sailing the Barque of Peter over to the pirates. Who do you think this Benedict really is? He's too intelligent not to be fully aware of what he is doing and the implications of what he is saying (and not saying). In Deuteronomy 28 http://www.drbo.org/chapter/05028.htm and Leviticus 26 http://www.drbo.org/chapter/03026.htm God specified the contract of the Mosaic Covenant. He specified the duties of the Israelites to obey Him, the rewards if they obeyed Him, and the penalties if they disobeyed Him. Please note that God did NOT promise to reward defection with a real estate deal in the Middle East; He promised dispersal and misery. An utterly gratuitous assertion, which can be easily defeated by another. You're wrong, unless you can prove your accusation! If you wouldn't then that's a certain sign of insanity or gullibility. Now speaks an ignorant fool (I won't mince words here, since you're so insistent in spreading your filth here) who has been imbued with the Talmudic mentality. Such blasphemies!! You don't even need to be refuted; you have done so yourself, understanding nothing! Dear anonymous Israeli, your insanity is evident in your belief that you have a blood association with the people of the Bible and that chunk of land in the Middle East that you call "Israel."